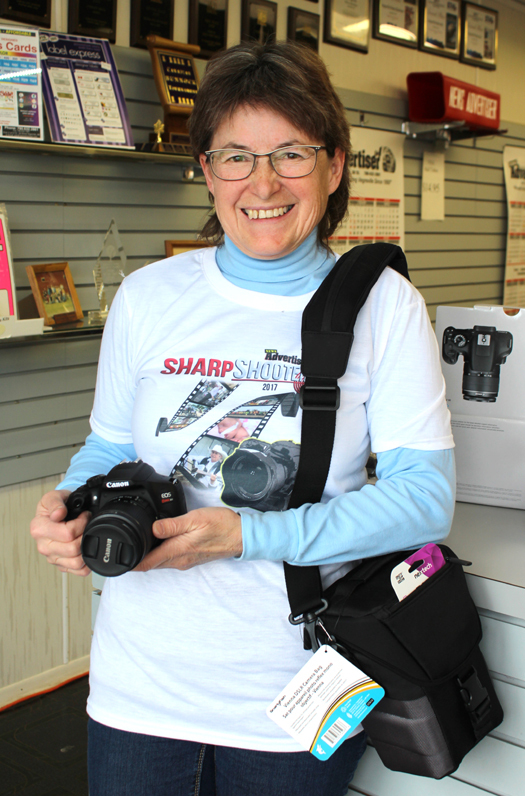 Welcome to the Vegreville News Advertiser Sharpshooter Contest Page! with your name, where you are from (public), your phone, email and age (private). may result in a non-submission to the contest. If your photo is selected, you win a sharpshooter T-shirt and you are entered to win a fantastic camera package! All photos submitted will be displayed online. Conditions apply, see below for rules and details. Please select one Photo to upload. One photo entry per person per week. a camera bag and memory card. WHO: The Vegreville News Advertiser Sharp Shooter Photo of the Week Contest is open to all non-professional photographers. Those under 18 years of age must submit parental consent. The operational team of The Vegreville News Advertiser, and their immediate families are excluded from participating. WHAT: We are looking for original, recent, striking images of your community. We encourage entries from all communities in our circulation area. WHEN: Entries may be used for future publications even if entered before the next publication date. Entries may used for the following year’s contest if submitted in December of the previous year. A limit of three t-shirts can be won per person per year. HOW: One photograph may be submitted per person per week. Entries may be entered by uploading digital files via http://test.newsadvertiser.com/index.php/contests/. FILE REQUIREMENTS: Digital images or scans of prints may be uploaded. Original files of camera-made digital photos may not exceed five megabytes (5 MB). The Vegreville News Advertiser cannot be responsible for lost, damaged, late or misdirected entries, or for faulty uploading connections, garbled transmissions, unauthorized intervention, or technical malfunctions. JUDGING: Judging will be done by The Vegreville News Advertiser Staff. Entries will be judged on originality, technical excellence, composition, overall impact, and artistic merit. Decisions made by the judges are final. WINNING ENTRIES: All entries may be used by The Vegreville News Advertiser, in printed publications, on any VNA web asset, in a slideshow, or in any other media, and may be copied and displayed in any country, provided that all uses are accompanied by appropriate attribution to the photographer. Entrants retain ownership and all other rights to future use of their photographs. VNA holds copyright to the collection of photos that constitute the VNA Sharp Shooter Photo Contest. VNA shall have the right to verify, in its sole judgment, winner eligibility. A selection of winning photos may be featured on VNA’s website – www.newsadvertiser.com. Winning images also may be used in a slideshow, on social media, in VNA publications, or in VNA offices. PREVIOUS WINNERS: Finalists (winners of the camera package) from the previous year are not permitted to submit/enter for the current year. LEGAL CONDITIONS: To enter the contest, you must agree to the Legal Conditions (see legal condition below). Entry of photographs into the Contest implies acceptance of these conditions, regardless of whether entrants sign a statement confirming acceptance. Copyright: By entering, you retain copyright and remain the owner of your images and may also continue to use them in any manner you choose. You agree that the images you submit may be used in printed publications, on VNA’s website, in a slideshow and screensaver, may be uploaded on VNA’s social media channels, or in any other media, and may be copied and displayed in any country provided that you are afforded appropriate attribution as the photographer. For questions regarding the 2018 Sharp Shooter Photo Contest, please contact the VNA Office, 1-780-632-2861 (toll free:1-800-522-4127). By entering, you retain copyright and remain the owner of your images and may also continue to use them in any manner you choose. You agree that the images you submit may be used in printed publications, on VNA’s website newsadvertiser.com, in a slideshow and screensaver, may be uploaded on VNA ‘s social media channels, or in any other media, and may be copied and displayed in any country provided that you are afforded appropriate attribution as the photographer. You are entering this contest at your own risk. You must agree that, regardless of the outcome, you will not challenge the results of the VNA Sharp Shooter Photo Contests (the “Contest”) or file any claims or suits against The Vegreville News Advertiser (VNA), their affiliates, directors, officers, or employees, arising from the conduct of the Contest. You agree that VNA need not return to you any images you submit and that VNA may, in its sole discretion, terminate this contest without any liability to you. If VNA terminates the Contest before its completion, VNA agrees that it will not use your images for any purpose. You promise that you are at least 18 years of age (or if under have parental consent), you are not an employee (or an immediate family member of an employee) of The Vegreville News Advertiser. You promise that the photographs you submit (a) are your own work, (b) do not (to your knowledge) infringe on the rights of any other person or business, and (c) have not been previously published. You promise that any individual persons depicted in the photographs (except outdoor crowd scenes) have given you permission to use their image in your photograph. We ask for this promise because we want you to be respectful of the persons you photograph and considerate of their sensitivities concerning the use of their image in your photograph. You agree that The Vegreville News Advertiser is not endorsing any organization depicted in the photographs entered in, or chosen as winners of, the Contest. You promise that your photograph accurately reflects the subject matter and scene as it appeared, and that it has not been digitally altered beyond standard optimization (removal of dust, cropping, adjustments to color and contrast, etc.). You agree that VNA will not pay you for your images, whether you win a prize or not. You agree that VNA is not acting as an agent, publisher, or intermediary for the photograph(s) you submit. Any inquiries from outside parties about the purchase or use of your photograph(s) will be passed on to you, the photographer, directly. VNA holds copyright to the collection of photos that constitute the VNA Sharp Shooter Photo Contest. By entering this Contest, you agree that VNA may verify the eligibility, ownership and originality of any submission, and that upon request, you shall submit a written copy of any release, license, or permission you have received from a third party granting you the right to use such submission. You understand that in the event your submission is selected as a winning submission and your ownership rights and the originality of your submission cannot be verified to the satisfaction of the VNA, or it is in any other way ineligible, the VNA shall select an alternate winner based on the same Judging Criteria. VNA assumes no liability to third parties for unverified ownership rights claimed by entrants. If after announcing the winners VNA determines that a winner has misrepresented, mischaracterized his or her submission in any way, or is not the rightful owner of the submission, the submission may be disqualified from the Contest, and any prizes or privileges received by the entrant as a result of winning this contest may be rescinded. Any determinations made by VNA in withdrawing and disqualifying any submission will be final.